Bad news is? Is BO shows little interest in reusability when it comes to orbital launches using New Glenn…Good news? (Since Doug Messier has made this blog focus on Space Tourism) The New Shepard program will continue to focus on reusability for suborbital launches….And BTW, an BO executive confessed that the first Blue Origin employees will be launched into space before the end of the year. Suborbital hop above the Farm in line. So then I guess we will have to hear Bezo’s welcome SpaceX and Boeing to the club when they launch astronauts into orbit, like when he claimed being first to launch a reusable rocket to Space. I don’t know where this crap comes from? BO has baselined booster reuse with NG. It will be a day-one reusable systems by multiple accounts. Since the NG 1st stage is intended to launch over the Atlantic, and being larger and more massive than the Space X cores, the question arises, will booster Flyback work as advertised? ‘Lack of interest’ is admittedly an erroneous appraisal on my part, but where is the work on the recovery ship? Building the recovery ship should be straight forward, since marine technology has reached a plateau in the past 100 years?…As far as upper-stage recovery prospects? …When will that happen? if ever? What’s wrong with being an employee of BO and taking a brief trip above the meaningful atmosphere? and enjoying a few minutes of zero-g while getting PAID for it. !…Mr SpaceAge? I don’t think your employer offers you the same perks. We all get f–king exhausted once in a while, don’t we? Blue Origin has consistently operated with much less publicity than SpaceX. That’s their choice, and as a private venture they don’t owe anyone any progress reports. And it’s not evidence that they’re not working on it. As for the recovery ship, given New Glenn is still at least two years from first flight, they aren’t exactly pressed for time to acquire and modify an existing vessel just like SpaceX did. Consider that the time between SpaceX’s announcement of its first ship construction contract and the first landing attempt was only four months. I commented openly doubting BO’s schedule on having their launch infrastructure done in time. Someone here provided a very nice satellite imagery tool that shows changes of geography by time. I had to eat crow on that one. BO does not operate in the open as much as others, but they’re getting work done. 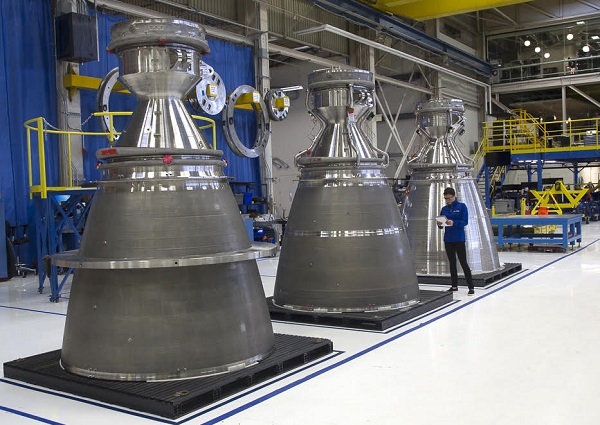 And in any case, New Shepard is BO’s Grashopper/F9R, continuing to develop their competence in vertical landing (and not necessarily on Earth), as well as hardware that lends itself to upper stage applications. The only difference is that SpaceX saw no operational uses for their developmental rockets, BO does. You should not drink… and bake. Yes, everyone is getting work done – much of it without benefit of glaring publicity. Perhaps some of these commenters here got used to the Carmack-era Armadillo Aerospace SOP of stream-of-consciousness blogging about every little jot and tittle and assume that to be normative for every other NewSpace company going forward. As you quite correctly note, absence of evidence is hardly equivalent to evidence of absence. And it also doesn’t help when evidence that does exist is ignored. He is objecting to Bezos’ deliberate confusion of “space” and “orbit”. Following their Tweets helps. A lot is posted by Jeff Bezos that never makes the space blogs. For example no one seem to notice his tweet about giving a talk to the NRO in March. Also nothing on Invite Only Mars2018 conference in Palm Springs. MARS stands for Machine home Automation, Robotics and Space, although Rocket Lab made a presentation. I saw it on this Tweet, but it was Planetlabs that did the imaging/GIF. That ReSpaceAge as in Reusable SpaceAge. And I think it is great that Blue will launch a human sooner than later. Paul is correct about my comment. Jeff deliberately suggested to the uniformed general public that his suborbital New Shepard compared to SpaceX orbit class first stage recoveries. Little league comparing himself to the major league. Hope to see Blue join the major league’s sooner than later. I stay away from social media platforms as a general thing. I’m happy to let you slog through Twitter so I don’t have to. Carmack was always great in info both for doom/quake as well as armadillo. It was a development system and launching real cargo. Unlike BO, sX went from F1 to F9 operational, in a relatively short period. And to be honest, SX has been really quick on all of their projects, save F1. Just thinking about it, SX going from start of company in 2005 to likely launching BFR in 15 years, really is amazing. Apropos Falcon 1…SpaceX has recovered the F9 first stage 24 times…that’s 5x the number of Falcon 1’s ever launched! Kinda nuts. Eh…debatable. SpaceX is really good about getting other people to pay for their R&D. Sure F9RDev and Grasshopper was out-of-pocket, but recovery dev using ASDS and the RTLS flights – they had customers. Of late, they’ve been doing fairing recovery R&D on flights that somebody paid for. F1 was meant in same way that new Shepard is for BO. Both were/are development systems. But I find it interesting that SX is so far ahead of BO, yet both started around same time.